This was an eight day crossing of the North Atlantic. The voyage started in Manhattan at the historic passenger ship terminal (Pier 90) and culminated at the Mayflower Terminal in Southampton, England. Queen Victoria presents a sophisticated and elegant cruise experience. Guests enjoy intellectual and cultured activities in a refined setting. There are no waterslides or amusement park features. It is a civilized atmosphere in the tradition of the great ocean liners of the 20th century. Much smaller than the Queen Mary 2, Queen Victoria has a more intimate feel. Compared to other modern cruise ships, she would be a medium size ship. The passenger mix on this voyage was approximately two thirds British and one thrid North American with a sprinkling of other nationalities. Inasmuch as Queen Victoria primarily serves the U.K. market during her summer cruising season, the ship is somewhat geared toward British passengers. However, North Americans, particularly those versed in British culture will not feel alien in this environment. In addition, all prices are in U.S. dollars. Cunard has a very loyal following and the majority of the passengers on this voyage had traveled on a Cunard ship before, usually more than once. As a result, the past passenger parties, which are a perk of the Cunard loyalty program, were very crowded. Seeemingly, they were just as crowded as the Welcome Aboard party, which is open to everyone. The ship was on the last leg of it annual world voyage. As a result, some passengers had been on the ship for three months. However, most had joined either in New York or Fort Lauderdale. Because the ship was at the end of her world voyage, the selection of goods in the shops was somewat limited. For example, all the cameras had been sold by the time we arrived. Eight days on a ship with no port calls may give some people pause. However, Cunard excells in its sea day programming. It has an excellent enrichment program. Hostage negotiator Terry Waite was the celebrity speaker and his talks packed the ship's theater. While the other speakers were less famous, they did have the ability to captivate an audience. One speaker was a former British police detective who talked about some of his past cases. Another speaker spoke on astronomy while a third speaker discussed topics relating to World War II and the Cold War. The assistant entertainment manager also gave a talk about the Titanic disaster. In addition to the speakers, there were a variety of activities during the day. These ranged from such unique activities as fencing lessons to the ever-popular trivia contests. Bridge lessons, chair aerobics, and classical music recitals were among the other activities. Then in the afternoon, there were the white glove afternoon teas in the elegant Queens Room ballroom. In short, there was more to do than time to do it in. The evening entertainment also had variety with a mixture of production shows and guest entertainers. The production shows were competent but not extraordinary. Guest entertainers included American comedian Rondell Sheridan who was able to evoke laughter from a mixed group of nationalities. Magician Brett Sherwood also received good reviews from passengers. Breakfast and lunch in Queen Victoria's main dining room is open seating. For dinner, Queen Victoria adheres to the traditional two seating system where each guest is assigned to a specific table at one of the two seatings. The chief advantage of this system is that over the course of your voyage to get to know your servers and the other people seated at the table. Our experience was that the servers at all the meals in the main dining room were efficient and friendly. The servers who attended our table at dinner were no exception. They also came to know the various preferences of the people at the table. The food in the main dining room was good. There was considerable variety and the food was prepared nicely. As a general matter, the food was mild rather than spicey. Although sections of the Lido buffet restaurant are used as additional specialty venues in the evening, Queen Victoria has one dedicated specialty restaurant - - the Verandah. We had lunch in the Verandah one afternoon. We were impressed by the service but not by the food. Friends who had dinner in the Verandah told us that the food at dinner was much better than at lunch. Overall, the crew seemed happier than on our previous voyages on Queen Victoria. As a result, the service was more efficient and friendlier than before. In keeping with the ocean liner traditional, the relationship between passengers and crew is somewhat more distant than typically found on cruise ships serving the North American market. Thus, the cabin stewards, waiters and bar staff are always respectful of the guests and do not attempt to become your buddy. Some of the personnel at the guest services desk, however, were unnecessarily stiff and defensive. It is a much better experience when the front desk views its role as a means of helping passengers with their problems rather than as the first line of defense in an ongoing battle in which the guests are the enemy. 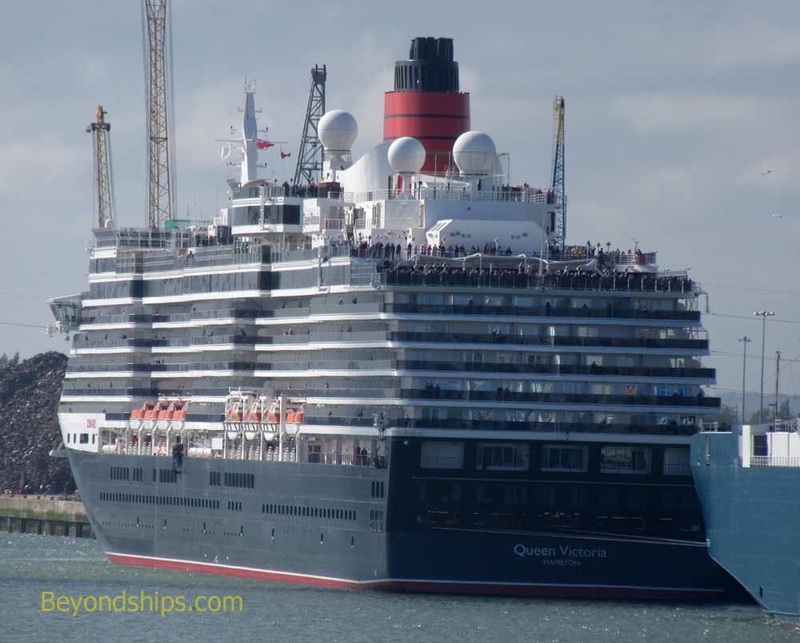 Queen Victoria is an extended version of the Vista class cruise ships. (Examples of other Vista class ships are Holland America's Westerdam and P&O Cruises' Arcadia). Due to her extra length, Queen Victoria has better lateral stability. However, she is not immune from the motion of the sea. On this crossing, she handled the sea well but with occasional movement.